As video resolutions evolve from HD to UHD and beyond to 8K, encoding technologies to compress video also evolve. They must do so to accommodate the larger resolutions as well as the bandwidth and storage requirements of the broadcast and media industry. Today we are experiencing a codec war between two competing standards, H.265/HEVC and VP9. This is a continuation of the previous generation codec battle between H.264/AVC and VP8. Analysis shows that H.265/HEVC and VP9 are in many practical situations equally efficient, providing similar levels of compression efficiency and visual quality with the same given hardware. So when choosing between the two codecs, pure quality should not be the major differentiator. 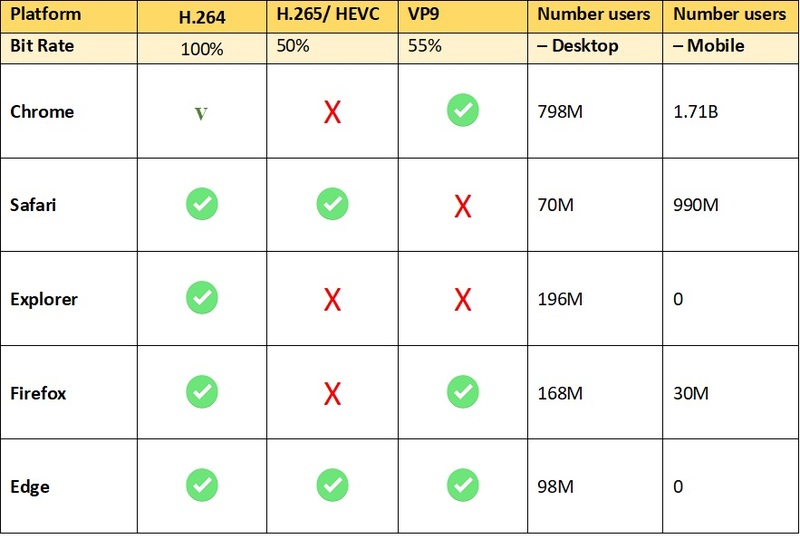 In last decade’s battle between H264/AVC and VP8, both standards were widely adopted by encoding products, browsers and players alike - but arguably H.264/AVC won out by being employed on just about every operating system, browser, player and encoding device in existence. Apple’s decision not to implement VP8 may have had a contribution to the success of H.264/AVC, but even so it did not stop other mobile players from supporting VP8. With the current generation H.265/HEVC and VP9 encoders, there are many reasons why companies may deploy either in their products and services, which we will examine further in this article. One of the main obstacles delaying H.265/HEVC adoption is the licensing and royalty situation, which is confusing and still subject to uncertainty. Many companies contributed to the development of the H.265/HEVC standard, and as a result there are three patent pools that are demand royalties – MPEG LA, HEVC Advance and Velos Media with a further number of IP holders not in any patent pool. See diagram below by Jonatan Samuelsson from IBC 2018 paper. A subset of the organizations that have declared to hold HEVC essential patents. Conversely, the VP9 standard is an open source, royalty free format that was developed by Google. Google originally developed VP9 mainly for YouTube content. In fact if you want to utilize YouTube in 4K, you have no choice but to use VP9. Google has licensed a number of patents to provide cover for VP9 and future codecs. VP9 has a much larger potential user base, as decoding support has been adopted within Firefox, Edge and Chrome, the most popular global browsers. H.265/HEVC has only been adopted by Edge and Safari. Given every Android phone ships with Chrome, the numbers of potential decoders is huge. For video contribution within the enterprise space, only H.265/HEVC solutions have been adopted by the major manufacturers as the next generation after their H.264/AVC products. However these are specialized solutions used for ingest of streaming video from a remote live location back to a broadcast center, typically used for live remote productions. At the receiving end they are typically encoded again for production. There has been little focus in the media industry on H.266/VVC (Versatile Video Coding), considered to be the next encoding standard after H.265/HEVC from MPEG/ITU. Its aim is to give a +30%-bit rate improvement over H.265/HEVC and will lend itself to formats for 4K, 8K and even 16K. Instead, there is now an industry focus on AV1. This is generally considered to be the successor to VP9 and initial tests are showing a 25% improvement in bit rate. The general feeling is that it could be very widely adopted due to the nature of its open source approach. There are also potential improvements over H.265/HEVC, although this has yet to be fully quantified. AV1 was initially called VP10, and was being developed by Google as the successor to VP9. Along the way Google decided to throw the development of the new standard open to a larger community, creating the Alliance for Open Media (AOM) which was announced on September 1, 2015, with Google contributing its VP10 program to AOM. The founding members were Amazon, Cisco, Google, Intel Corporation, Microsoft, Mozilla, and Netflix. At the time, the formation consolidated the development of three potentially competitive open source codecs including VP10 but also Cisco's Thor and Mozilla's Daala. There is some concern about potential litigation around AV1 – Nokia sued Apple in 2016 around patent infringement of H.264/AVC, which was settled out of court. There is no suggestion a lawsuit is imminent with AV1 but there have been some rumblings in the industry, with so much at stake. But despite that, the prospects for AV1 seems positive, especially given the royalty issues around H.265/HEVC. At the end of the day, it’s all about adoption rates. It could take a few years to determine a winner. Nevertheless AV1 has some very large companies behind it. As an encoding company that specializes in FPGA technology for low bitrate encoding, including VP9 and HEVC, NGCodec firmly believes in a multi codec approach for their customers. By providing the backbone to many cloud based encoding solutions, NGCodec technology is optimized for low bandwidth, high-quality applications for H.264/AVC, H.265/HEVC, VP9, AV1, and will be keeping a close eye on H.266/VVC as part of its future roadmap. So in summary, despite the extra complexity, customers will demand all four codecs: H.264/AVC for legacy devices, H.265/HEVC for premium and enterprise, VP9 for mass market Android support, and AV1 as a possible successor for the whole market.